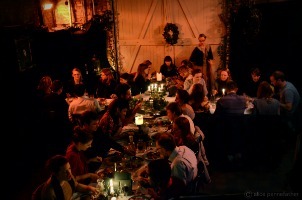 Experiential underground dining group Gingerline has revealed to Event its series of pop-up dining events have sold out until May 2014. The first set of 2,000 tickets for its latest project, The Hideout, taking place across the east London overground line, sold out in five minutes. This prompted organisers to continue running the event into May this year. A fluid arrangement with Gingerline’s venue partners has meant the pop-up company has control of when the event will come to an end. Participants who book a ticket for The Hideout then have to wait for a text confirming a location and travel via train to enjoy ‘four or more courses of foodie delights’. Gingerline promises diners will also experience art, performance and festivities alongside their culinary experience. Susannah Mountfort, co-founder or Gingerline, said: "We are delighted that there is a positive response to our project. Each time we grow in confidence about what is possible, but we never take the fact we will sell out for granted. It's never a given. We have a great following, so we’re continuing to become bolder and put more money into our events. She added Gingerline has a big project planned for later this year, with details to be announced later this summer. The dining events are produced by Darling and Edge, a bespoke art direction and set design production company that has previously worked with Selfridges and Sony. Past events involved a puppeteering workshop, a ‘dive’n’dine’ event in a Shoreditch submarine mess hall and a candlelit dinner in Canonbury chapel.